Discover the charms of a Caribbean island, from colonial architecture and coral reefs to captivating museums and miles of sandy beaches. Curaçao is a southern Caribbean island, popular with beach lovers and divers. Explore its natural parks and museums to appreciate its natural and cultural attractions. The coastline has miles of white sandy beaches, clear waters and secluded rocky coves. Most of the best beaches are on the southern and western sides of the island. Lounge on warm sands, have a drink in a beachside bar and participate in a variety of water activities. Kayak through the waves at Blue Bay Beach, windsurf at Seaquarium Beach and waterski and jet ski off Papagayo Beach. Explore Curaçao’s underwater world on a diving expedition. See large sponges, an airplane wreck, a sunken cargo freighter and a forest of coral. Go as deep as 1,000 feet (320 meters) below the surface in a mini-submarine. Enjoy excellent snorkeling opportunities in the clear, shallow water close to shore. Away from the beaches and aquatic attractions, drive to Christoffel Park in the north for its flora and fauna. 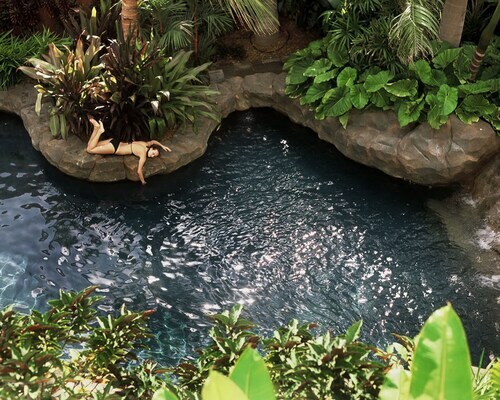 Follow hiking trails through thick tropical vegetation, past fields of orchids and around hills. Book a four-wheel-drive sunrise safari to spot deer and other animals. Nearby is Shete Boka National Park, home to Boka Tabla, where waves crash into an underground cavern. Make your way to Willemstad, Curaçao’s capital city. Stroll through the narrow streets of this harbor town and admire the pastel-colored Dutch colonial buildings. Glean insights into Curaçao’s history by visiting the museums. Kura Hulanda Museum charts the island’s role in the slave trade. Inside the Maritime Museum, inspect maps and artifacts that document more than 500 years of Curaçao’s seafaring past. Shop at the Floating Market, a string of visiting boats from Venezuela that sell fresh produce. Ask a fisherman to recommend an outdoor café. Curaçao is about 35 miles (56 kilometers) off the north coast of Venezuela in the southern Caribbean Sea. Reach the island by flying into Curaçao International Airport. 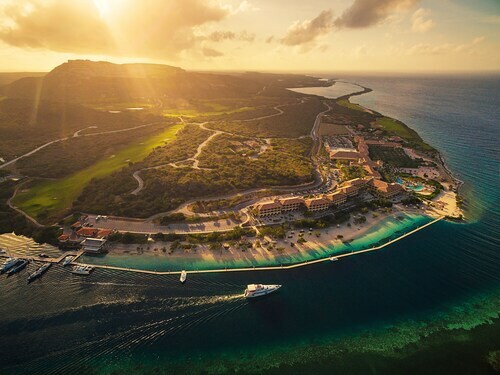 Located outside the hurricane belt, Curaçao is a popular destination year-round. 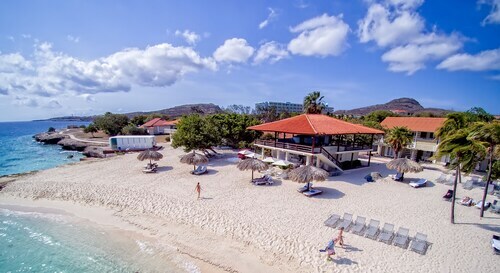 Santa Barbara Beach & Golf Resort is situated on Curaçao's south coast, right on the beach, where guests can learn to scuba-dive, snorkel, kayak, and stand-up paddleboard. The island's capital, Willemstad, is 30 minutes away and easily accessible. The airport is a scenic 40 minute drive from the hotel. Facing the Caribbean Sea and east of downtown Willemstad's shopping, dining, and sightseeing, this multi-section hotel is centered around an 18th-century Dutch Colonial mansion. 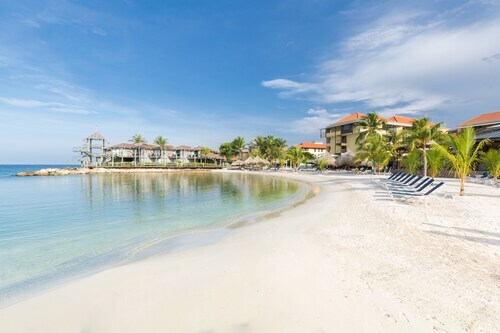 A 5-minute walk from resort's historic Rif Fort, Renaissance Curacao Resort & Casino overlooks the warm waters of the Caribbean Sea from picturesque Willemstad. Guests can bus around the island from the nearby station, or hike across Christoffel National Park, a vast reserve only 30 minutes away by car. 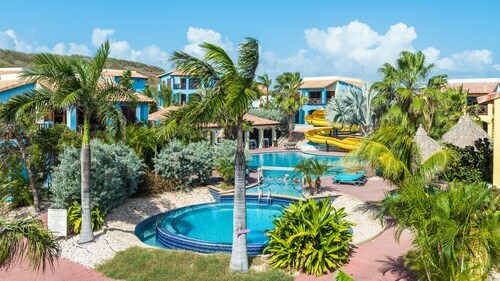 This family-friendly Willemstad hotel is located on the waterfront, within 2 mi (3 km) of Mambo Beach and Curacao Sea Aquarium. Parke Tropikal Zoo and Zuikertuin Mall are also within 3 mi (5 km). Located in Piscadera, this romantic resort is within 3 mi (5 km) of Sambil Curacao, Curacao Museum, and Renaissance Shopping Mall. Rif Fort and Museum Kura Hulanda are also within 3 mi (5 km). 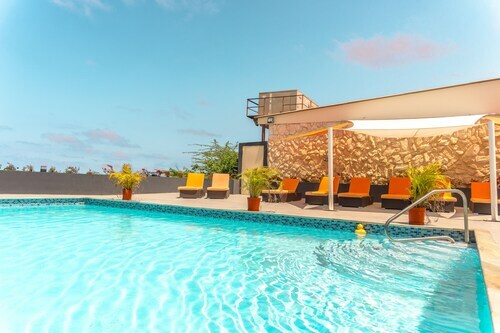 Situated near the airport, this spa hotel is 0.2 mi (0.4 km) from Hato Caves and 2.4 mi (3.9 km) from University of the Netherlands Antilles (UNA). Blue Bay and Sambil Curacao are also within 6 mi (10 km). This family-friendly Daniel property is located near the beach, 2.4 mi (3.8 km) from Landhuis Jan Kok, and within 6 mi (10 km) of Daaibooi Beach and Porto Marie Beach. Cas Abao Beach and Blue Bay Beach are also within 9 mi (15 km). 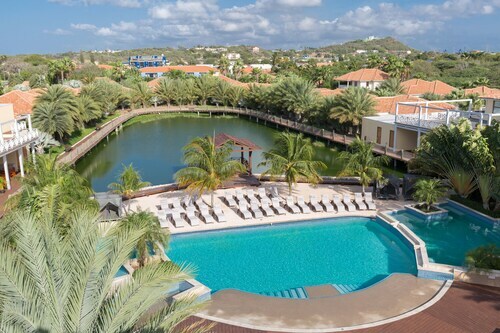 Located in the heart of Willemstad, this luxury resort is within a 10-minute walk of Museum Kura Hulanda, Fort Amsterdam, and Postal Museum. Governors Palace and Fort Nassau are also within 3 mi (5 km). Mon., 23 Sep. - Thu., 26 Sep. Looking for Flights, Hotels, Car Hire and Holiday Rentals in Curacao?